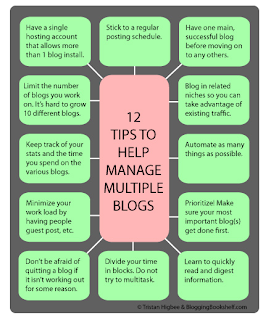 Well written / visualized article on maintaining multiple blogs effectively. I for one, think there are multiple advantages to keeping your topics on separate blogs. Have been slowly becoming more productive writing my thoughts on a variety of topics on blogs instead of paper and its environment friendly too ! Creating a blog to manage topic-wise content happened on a whim since it felt better organized. Why writers need multiple blogs ? It almost feels like I'm writing a book of thoughts pertaining to a set of hobbies or interests that could fluctuate over time. Slowly, I'm observing a small pattern emerge from the whole process of containing the writing into their own identities. For now the urls are all sub-urls within my own domain, but I've checked the availability of individual domains (on impulse again) just to see if it fits into the broader plan. I'm treading a very thin line of creating content and formulating a long-term plan/goal together. Don't want to end up changing the footer every day instead of adding proper content. I've created this snippet with the sole prerogative of initiating & collecting data on forging multiple signature blogs without indulging in the headaches involved.